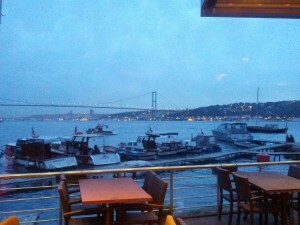 Villa Bosphorus is located on the Asian side of Istanbul with a spectacular view of the Bosphorus bridge. They offer a delicious seafood menu and a wide assortment of quality wines. 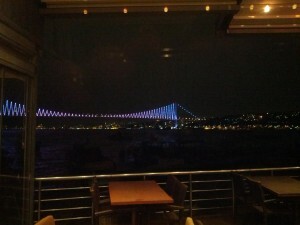 Probably best during summer nights when you can sit outside and gradually see the lights of the Bosphorus bridge go on to perform their magical show. Villa Bosphorus serves traditional Turkish cuisine with a broad range of different fish dishes. All extremely fresh and delicious. As in most Turkish restaurants, we recommend to start with some small meze’s and continue with several smaller main menu dishes. Ask the waiter to serve all orders in small portions so you can enjoy the different dishes. The easiest way to get to Villa Bosphorus is by car (or taxi). They have parking space in front of the restaurant which is free of charge.